Tanya has been deaf from birth and grew up using sign language. Her whole family could communicate via sign language as well, so life at home was straightforward – other people, however, have not always been so helpful. Here, Tanya, now 28, tells her story. "There’s something about sign language which divides people," Tanya says. "Half of people you meet realise that it is, in effect, a whole new language, and not an easy one to learn at that, and therefore have respect for people who use it, and are even impressed by people who can use it fluently." She continues: "However, there are also plenty of people around who are absolutely terrified when they see a person using sign language and run a mile, metaphorically at least. I don’t know why – after all, it’s not like any deaf person will automatically assume everyone can use sign language. In fact, it’s quite the opposite – I am always pleasantly surprised when someone signs back to me if I didn’t know they could before that." Tanya says that shops are one of the worst places for people who sign. "It’s strange – in this day and age no-one really speaks that much in shops anyway. Perhaps in the butchers or the bakers or something like that but in a newsagents or a supermarket, there is very little conversation anyway. "And yet, there have been plenty of occasions when shop assistants have stared at me and virtually refused to serve me just because they can see that I am using sign language to whoever I am with." But when people can sign, it's a great feeling, as Tanya explains. "On the other hand, it’s such a nice surprise when someone signs back to me when I don’t realise they can sign. It can happen anywhere and at any time." She adds: "Sometimes, you become so used to not communicating with anyone outside your closest circle that it actually takes you by surprise when someone else can sign as well." And one of the best things is that fluency isn't normally a problem for Tanya herself. "It doesn’t matter how good or fluent that person is – because of the nature of sign language, I can generally make out what they are trying to say even if they do not always understand me." Tanya says: "School was one of the places that this dichotomy was most in evidence. Some students and schoolmates decided to learn sign language which made communicating a lot of fun – it was almost like our own secret language which no-one else knew. "But there was a flip side: "But then there were the cruel children who mocked me for using sign language and being deaf. Thankfully, I had good friends and was fairly resilient but it still makes me wonder to this day what those children have grown up to become." "When I have a family of my own, I’d like my children to learn sign language. Obviously, it’s partly selfish so that I’ll be able to communicate with them fully but it’s also because I think it’s a great skill for them to have throughout life. "And Tanya concludes: "As well as being able to sign themselves, it will make their minds more open and more in tune with the idea of learning other languages as they get older. I think it’s a great asset for a person to communicate with sign language, just as much as any other language." 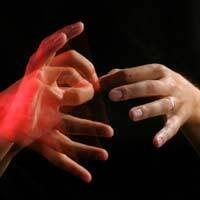 @Jonesy - I can only suggest you get in touch with some of the sign language associations directly and ask if they can guide you, and/or can give you any pointers to academic arguments and documents available and where you might be able to access them. They may even give you some direct quotes themselves if they are willing to be interviewed.